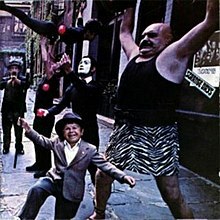 Strange Days is the second studio album by American rock band the Doors, released on September 25, 1967 by Elektra Records. The album was a commercial success, reaching number 3 on the US Billboard 200, and eventually earning RIAA platinum certification. The album contains the Top 30 hit singles "People Are Strange" and "Love Me Two Times". Strange Days was recorded during tour breaks between May and August 1967 at Sunset Sound Recorders in Hollywood (the same studio as their first LP). In contrast to the 1966 sessions, producer Paul A. Rothchild and engineer Bruce Botnick employed a cutting-edge 8-track recording machine. The protracted sessions allowed the band to experiment in the studio and further augment their otherworldly sound with unusual instrumentation and sonic manipulation. According to Botnick, this approach was inspired by the band obtaining an advance copy of the Beatles' Sgt. Pepper's Lonely Hearts Club Band album and "absolutely flipping out" at what they heard. Botnick said that, following the Beatles' example, the Doors were determined to pursue "new techniques of recording. No holds barred." Developed with the assistance of Paul Beaver, the title track constitutes one of the earliest uses of a Moog synthesizer in rock. On the Morrison poem "Horse Latitudes", Botnick took the white noise of a tape recorder and varied the speed by hand-winding it (resulting in a sound akin to wind) as the four band members played a variety of instruments in unusual ways. Further varispeed was then employed to create different timbres and effects. [full citation needed] The band also explored musique concrète techniques on the album. Session musician Douglass Lubahn played bass during the recording of the album. Several of the songs on Strange Days had been written around the same time as the ones that appeared on The Doors. Two ("My Eyes Have Seen You" and "Moonlight Drive") had been demoed in 1965 at Trans World Pacific Studios before Krieger joined the group; indeed, the latter had been conceived by Morrison prior to his fateful reunion with Manzarek in the summer of 1965. Although the song was attempted twice during the sessions for the band's debut, both versions were deemed unsatisfactory. A conventional blues arrangement, "Moonlight Drive"'s defining features were its slightly off-beat rhythm and Krieger's bottleneck guitar, which create an eerie sound. The LP's first single, "People Are Strange", was composed in early 1967 after Krieger, drummer John Densmore, and a depressed Morrison had walked to the top of Laurel Canyon. Densmore recalled the song's writing process in his book Riders on the Storm. Densmore and Krieger, who had then been roommates, were visited by a dejected Morrison, who was acting "deeply depressed." At the suggestion of Densmore, they took a walk along Laurel Canyon. Morrison returned from the walk "euphoric" with the early lyrics of "People Are Strange". Although Morrison was the Doors' primary lyricist, Robby Krieger wrote several of the group's hit singles, with his first composition being "Light My Fire". According to band members, his bluesy "Love Me Two Times" was about a soldier/sailor on his last day with his girlfriend before shipping out, ostensibly to war. Manzarek described the song as "Robby's great blues/rock classic about lust and lost, or multiple orgasms, I'm not sure which." In 1997, Krieger stated to Guitar World's Alan Paul that the musical idea for "Love Me Two Times" came from a lick from a Danny Kalb album. Manzarek played the final version of this song on a harpsichord, not a clavichord. Manzarek described the instrument as "a most elegant instrument that one does not normally associate with rock and roll." It was edited to a 2:37 length and released as the second single (after "People Are Strange") from that album, and reached No. 25 on the charts in the US. "Love Me Two Times" was considered to be somewhat risqué for radio airplay, being banned in New Haven for being "too controversial," much to the dismay of the band. The album concludes with the 11 minute-long epic, "When the Music's Over". The album cover of Strange Days, photographed by Joel Brodsky, depicts a group of street performers in New York. The location of the photograph is at Sniffen Court, a residential alley next to East 36th Street between Lexington and Third Avenue in Manhattan. The availability of such performers pictured was low, so Brodsky's assistant stood in as a juggler while a random cab driver was paid $5 to pose playing the trumpet. Twin dwarfs were hired, with one appearing on the front cover and one appearing on the back cover, which is the other half of the same photo on the front cover. However, a group shot of the band does appear on a poster in the background of both covers, bearing captions of the band and album name. (The same photograph previously appeared on the back cover of the band's debut album.) Because of the subtlety of the artist and album title, most record stores put stickers across the cover to help customers identify it more clearly. Strange Days was released on September 25, 1967 by Elektra Records. Although the album was quite successful, reaching No. 3 in the United States during a sixty-three-week chart stay in November 1967, its impact was attenuated by the enduring success of the band's debut album, which remained in the Top Ten over ten months after its release during a 122-week stay. According to producer Paul Rothchild, "We all thought it was the best album. Significantly, it was also the one with the weakest sales. We were confident it was going to be bigger than anything The Beatles had done. But there was no single. The record died on us." Music critic Robert Christgau called the album "muscular but misshapen" in a May 1968 column for Esquire, but went on to write that The Doors had come "from nowhere to reign as America's heaviest group". Rolling Stone Magazine opined that the album "has all the power and energy of the first LP, but is more subtle, more intricate and much more effective" and argued that the "whole album, individual songs and especially the final track are constructed in the five parts of tragedy. Like Greek drama, you know when the music's over because there is catharsis." Critics rank the album highly; in 2003, Strange Days was listed at No. 407 on Rolling Stone's list of the 500 greatest albums of all time. In 2007, Rolling Stone included it on their list "The 40 Essential Albums of 1967". In 2007, on the occasion of the release of the 40th anniversary edition of the album, Sal Cinquemani of Slant Magazine argued that "while The Doors had more frequent, obvious peaks, the quirky Strange Days is a more ambitious, unified work. There are fewer filler tracks and each song carries as much weight as the one before and after it" and called it "a document of a sometimes beautiful, sometimes scary, and often twisted era of fear and idealism." Some critics feel it does not quite match up to its predecessor. In his retrospective AllMusic review of the album, Richie Unterberger notes, "Many of the songs on Strange Days had been written around the same time as the ones that appeared on The Doors, and with hindsight one has the sense that the best of the batch had already been cherry picked for the debut album. For that reason, the band's second effort isn't as consistently stunning as their debut, though overall it's a very successful continuation of the themes of their classic album." 1967 "Love Me Two Times"
^ a b Pinch, Trevor; Trocco, Frank (2002). Analog Days: The Invention and Impact of the Moog Synthesizer. Cambridge, MA: Harvard University Press. p. 120. ISBN 0-674-01617-3. ^ Hopkins & Sugarman 1980, p. 128. ^ a b Maginnis, Tom. "Moonlight Drive – The Doors". AllMusic. ^ The Doors. eM Publications. p. 231. ^ Hoskyns, Barney (2007). Strange Day. Rhino Entertainment Company. p. 7. ^ a b Densmore, John (November 4, 2009). Riders on the Storm: My Life with Jim Morrison and the Doors. Random House Publishing Group. ISBN 978-0-307-42902-5. ^ Manzarek, Ray (October 15, 1999). Light My Fire. Penguin. p. 258. ISBN 978-0-698-15101-7. ^ "( The Doors > Awards )". AllMusic. Retrieved October 21, 2012. ^ "Classic Album Covers : Strange Days – The Doors". Never Mind the Bus Pass. February 2, 2012. Archived from the original on December 20, 2014. Retrieved December 20, 2014. ^ "Bam Interview – Paul Rothchild". waiting-forthe-sun.net. Retrieved December 20, 2014. ^ Unterberger, Richie. "Strange Days – The Doors | Songs, Reviews, Credits, Awards | AllMusic". AllMusic. Retrieved December 20, 2014. ^ a b "The Doors – Strange Days CD Album". CD Universe/Muze. Retrieved August 31, 2015. ^ "[Strange Days review]". Rolling Stone. November 23, 1967. Retrieved December 20, 2014. ^ "The Doors: Album Guide". rollingstone.com. Archived from the original on January 6, 2013. Retrieved August 31, 2015. ^ Cinquemani, Sal (April 18, 2007). "The Doors: Strange Days | Album Review | Slant Magazine". Slant. Retrieved December 20, 2014. ^ "The Doors Strange Days". Acclaimed Music. Retrieved August 31, 2015. ^ Christgau, Robert (May 1968). "Columns". Esquire. Retrieved May 26, 2013. ^ "Rolling Stone : Photos : The 40 Essential Albums of 1967 :". Rolling Stone. 2007. Archived from the original on July 7, 2007. Retrieved December 20, 2014. ^ Cinquemani, Sal (April 2007). "The Doors: Strange Days". Slant. Retrieved November 22, 2017. ^ "Strange Days". aln2.albumlinernotes. Retrieved November 11, 2016. ^ "The Doors – Strange Days". Discogs. Retrieved November 11, 2016. ^ a b c "The Doors Chart History (Billboard 200)". Billboard. Retrieved 21 June 2016. ^ "Canadian album certifications – The Doors – Strange Days". Music Canada. ^ "French album certifications – Doors – Strange Days" (in French). InfoDisc. Select DOORS and click OK.
^ "Gold-/Platin-Datenbank (The Doors; 'Strange Days')" (in German). Bundesverband Musikindustrie. ^ "British album certifications – Doors – Strange Days". British Phonographic Industry. Select albums in the Format field. Select Gold in the Certification field. Type Strange Days in the "Search BPI Awards" field and then press Enter. ^ "American album certifications – The Doors – Strange Days". Recording Industry Association of America. If necessary, click Advanced, then click Format, then select Album, then click SEARCH.